I finished it right before leaving for my Scrapbook Retreat this past weekend, but am just now getting a chance to post it. I am in absolute love with it and STILL can't thank Tracey at Traceyjay quilts enough for her suggestion when I was desperate for an idea! I am hoping to have a "rope" embroidery tutorial for those who are interested soon, since the woven spider web embroidery technique I used for the eyes were well received. I pieced some leftover scraps to make the binding. I just can't stop making pieced bindings!! I love the look and it just speaks to my "waste not, want not" side of me! Update on William? He is still here holding on strong in the NICU. The quilt was delivered to my friend on Thursday, but it should be in the mother's aunt's hand for delivery today. I have never been so anxious for feedback as I have been for this quilt. I want his mom to love it! I hope she knows how much it meant to me to make it for her even though I have never met her! The other stuff? Oh that? I guess I will tell you about the UNFINISHED PROJECTS! Is still on Ole Betsy, my long arm, waiting for me. It is loaded, so I just need to prepare some batting and get to work! I really need to mail it out. Especially since Mr. Boss was just visiting Connor's dad and he mentioned I had something in the works! On hold. The elusive Christmas quilt needs just one seam to finish piecing and some more planning and cutting for the appliques! On hold. It might actually be placed on the backburner. I need to make a concerted effort to concentrate on some various household decorations and window treatments. Mr. Boss would agree that I need to make sure I am intertwining family home needs with my obsession with quilts. I must re-organize my pantry or I just might scream. The clutter is becoming insane. I feel like I am going through their closets and dressers quarterly. No one really told me that boys grow up as fast as they do 14 years ago when we had our first. Or if they did, I blocked it out. Which reminds me...I have never posted Baby Button's nursery and he will be ONE in just a mere THREE weeks. UGH! I SHAMEFULLY FORGOT TO LINK UP WITH LEE. I am sure the mother will love this beautiful quilt, I mean, how could she not? The finished quilt looks beautiful. The mom will love it!!!! 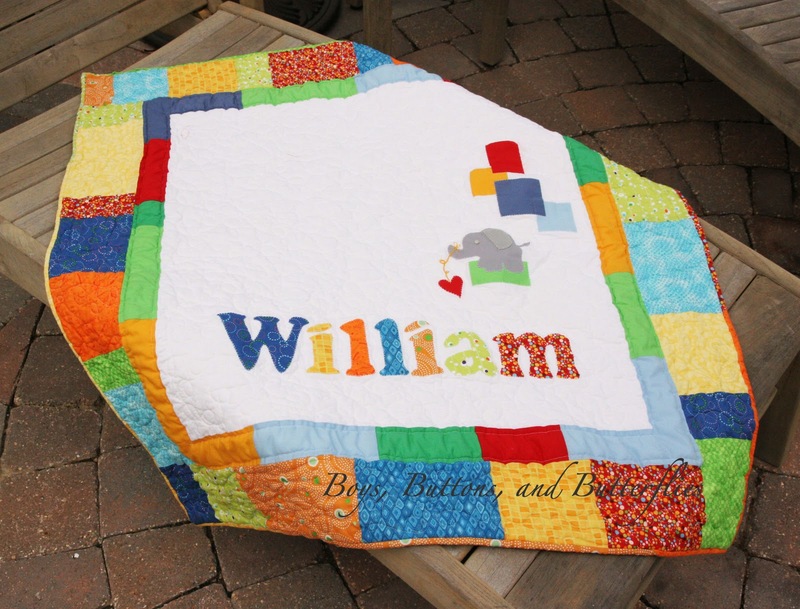 I am sure William's mom will be thrilled with the quilt and your thoughtfulness. Beautiful quilt for William! I am sure his mom will just cherish it always. I love baby William's quilt. So simple, yet so cute. I'm excited to see the Christmas quilt when you have a chance to show it! Keep us posted on baby William, we're praying for him and his family. Good luck with your pantry too. We're reorganizing/renovating right now and I can't find anything it seems like, so I understand the frustration. The quilt is so cute! I love bright and cheery colors. I know what you mean about the pantry, there are only two of us and some how I have managed to pack it to the brim with no order. A lot of it is doubles, just because I lost the original in the pantry! 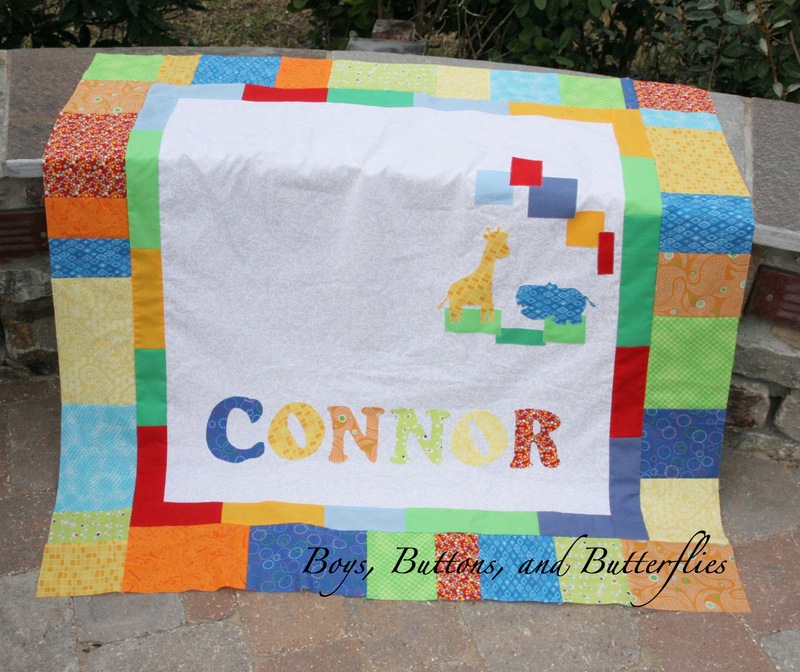 Love love love the boy quilts, lucky William and Conner- and those scrappy bindings are just perfect- so cute! I love baby william's quilt! simple and cute and I love the elephant. 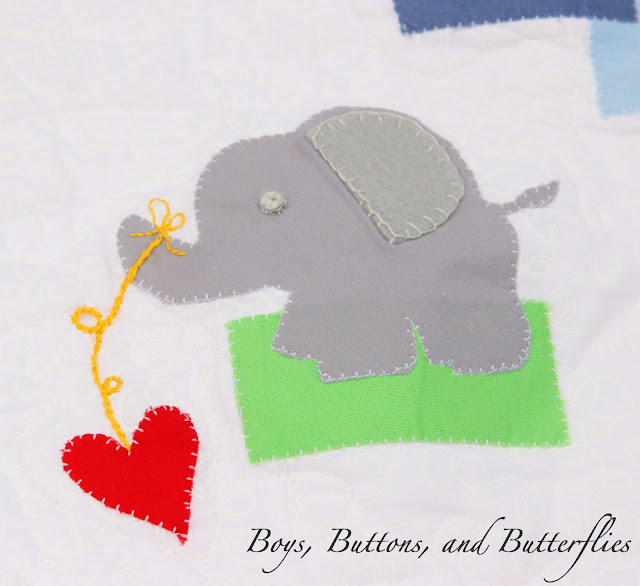 What a great baby quilt, the mom will be so thrilled. LOVE LOVE LOVE William's quilt. Of COURSE she will love it!!! It is really special and full of love!! I agree with everyone else...she will adore it. It's amazing and perfect!!! 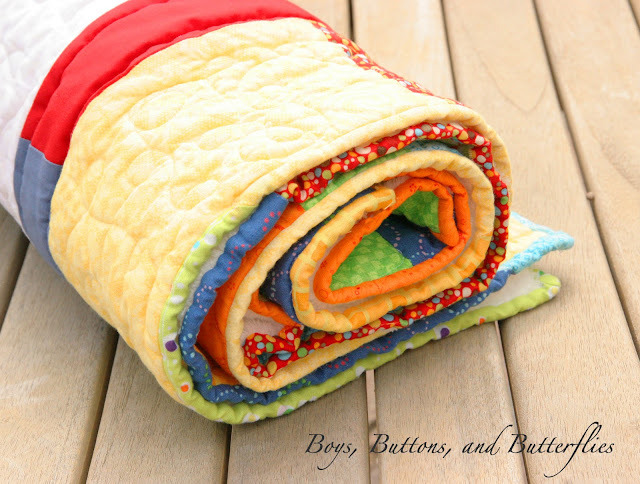 seriously, those baby quilts are adorable!